Oxfam: Combined Wealth Of 5 Richest Nigerians Could Lift Country Out Of Poverty : The Two-Way Oxfam calls the level of inequality in the country "obscene." The disparity is only growing, the charity says, in light of what it describes as the misallocation of the country's resources. 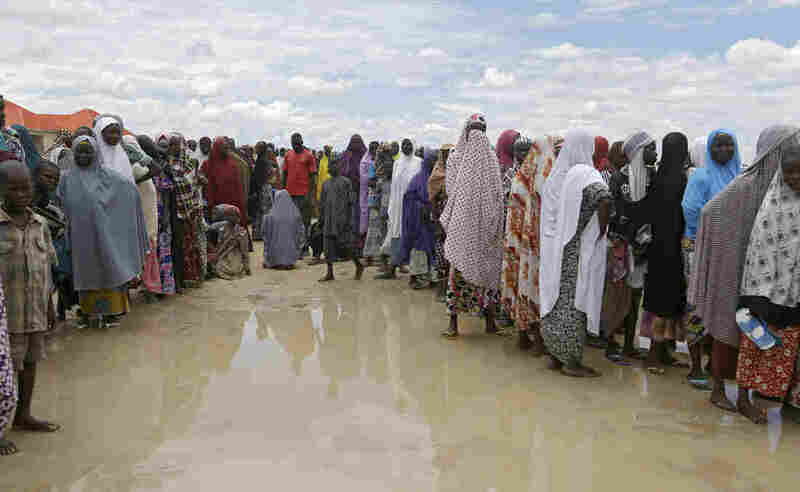 Women who say they have not been fed for five days line up for food in Aug. 2016 at the Bakassi camp in Maiduguri, Nigeria. The five richest men in Nigeria could bring nearly all Nigerians out of extreme poverty for one year, according to a new Oxfam report on inequality in the country. It's one of many stark conclusions drawn by the charity. Oxfam Nigeria's Good Governance Programme Coordinator Celestine Okwudili Odo describes the level of inequality as "obscene": "Extreme inequality is exacerbating poverty, undermining the economy, and fermenting social unrest. Nigerian leaders must be more determined in tackling this terrible problem." Nigerian government officials such as Minister of State for Budget and National Planning Zainab Ahmed criticized the "language, tone and style" of the document, according to the BBC. She also questioned the goals and methodology of the report. Inequality is growing in the populous West African nation, with more than half of its people living in extreme poverty, according to the report. The number living below the poverty line has grown from 69 million in 2004 to 112 million in 2010. "While more than 112 million people were living in poverty in 2010, the richest Nigerian man will take 42 years to spend all of his wealth at 1 million per day." "In one day, the richest Nigerian man can earn from his wealth 8,000 times more than what the poorest 10% of Nigerians spend on average in one year for their basic consumption." "A Nigerian lawmaker receives an annual salary of about $118,000 ... 63 times the country's GDP per capita (2013)." "Between 1960 and 2005, about $20 trillion was stolen from the treasury by public office holders." This issue is not due to a lack of resources but "to the ill-use, misallocation and misappropriation of such resources," the report argues. "At the root there is a culture of corruption and rent-seeking combined with a political elite out of touch with the daily struggles of average Nigerians." It points to a regressive tax system as one source of the growing inequality, as "the burden of taxation mostly falls on poorer companies and individuals." At the same time, the report states, "big multinationals receive questionable tax waivers and tax holidays, and utilize loopholes in tax laws to shift huge profits generated in the country to low tax jurisdictions." And then, those resources that the government "manages to collect are often spent in an unfair and inefficient way," the report states. It describes the country's governance costs as "astronomical and indefensible." One memorable scandal happened in 2015, when allegations surfaced that the nation's 469 lawmakers had been given a combined sum of $43 million as a "wardrobe allowance." "The report is not too far from the truth. There is no doubt that there is so much poverty in the country, but I don't think it's fair to the people mentioned in the report because they are private businessmen, who have built their wealth through hard work. The level of poverty is something that should be addressed to the government."